Wearing a lovely Abraham And Thakore silk sari, Vidya attended a birthday do, and later a wedding that same evening in Mumbai. With flowers in her hair, she rounded out the look with earrings from Joolry and a potli by Boga. I wish she had worn either a necklace or some bangles, the look felt much too bare without either. The bindi (when still on) did help though; Ms. Balan looked nice. At a diwali party last evening, Vidya was photographed in a sari by Pinnacle. Amrapali jewelry and a potli from Boga were her accessories for the evening. Usual notes still stand- Wish she’d try a blouse without a scoop-neck. And skip the severe do. But that aside, love the color on her; she looked nice. 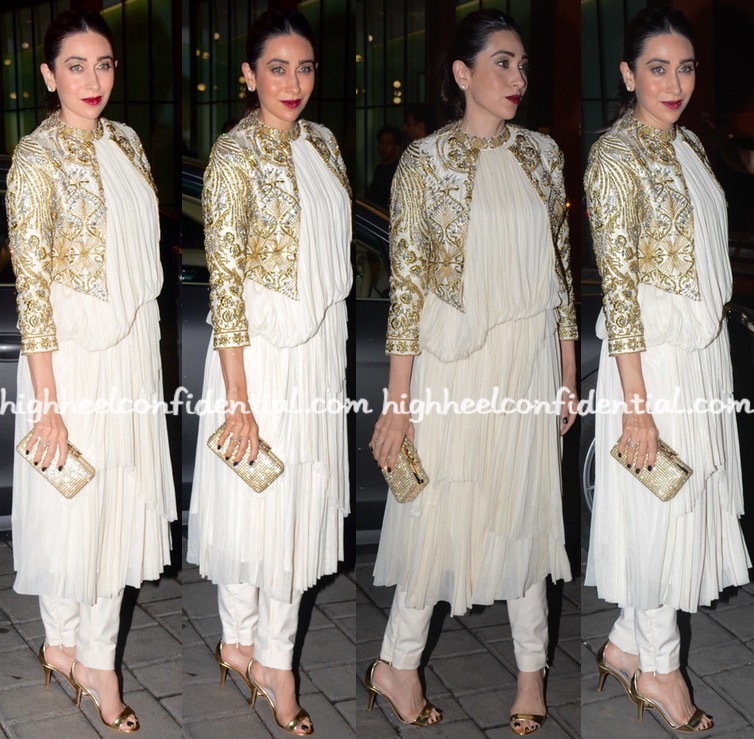 At a recent Diwali do, Karisma was photographed in Varun Bahl Couture separates. With her hair pulled back in to a centre-parted braided ponytail, a clutch from Boga and pair of gold-toned sandals rounded out the look. 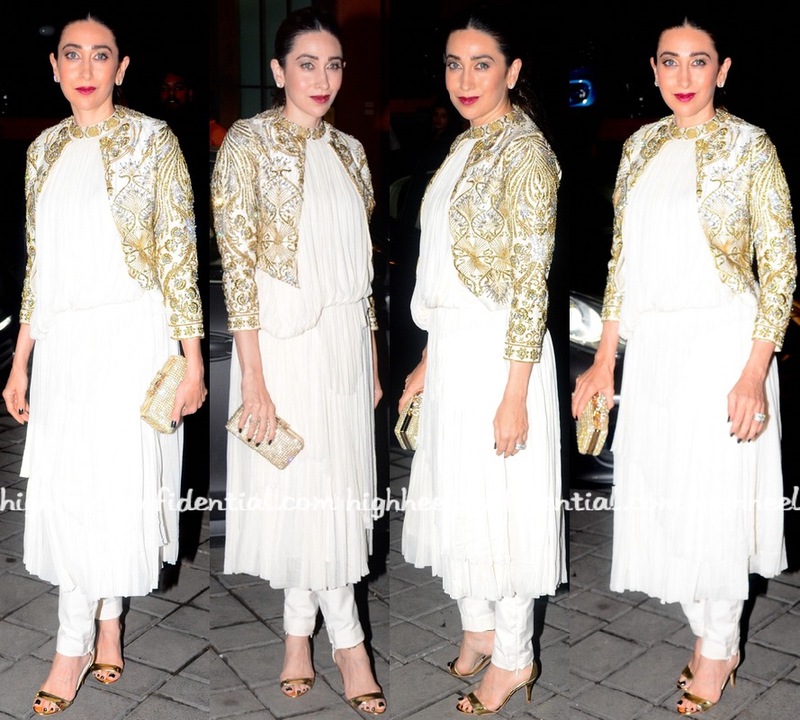 While these aren’t the best images to go by, I can still safely say the ruched kurta isn’t quite my cup of tea. Karisma to her credit though, fares better in it than most others would. 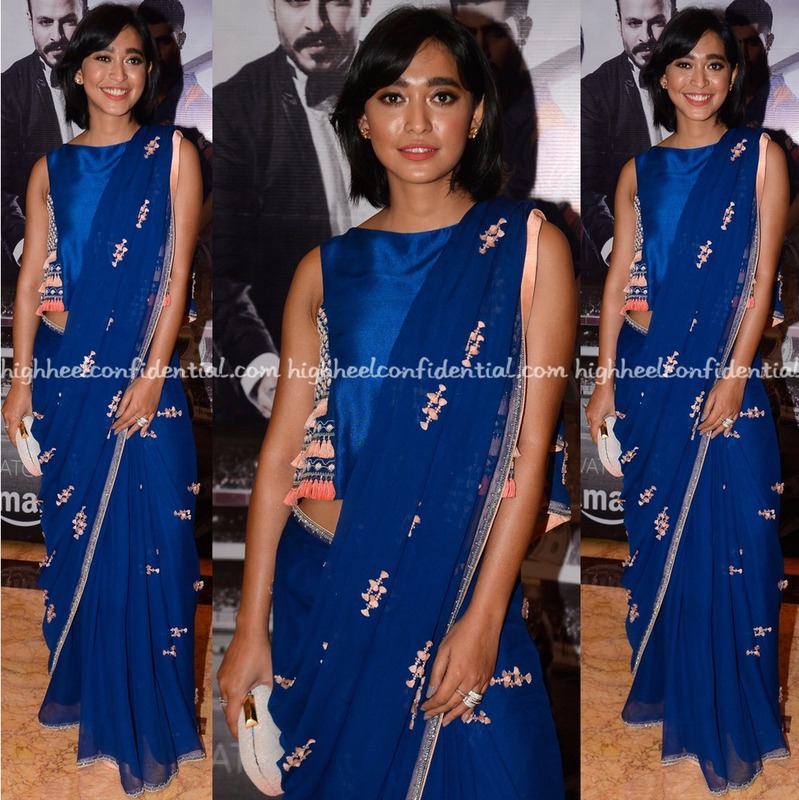 Wearing a Madsam Tinzin sari, Sayani attended a success do in Mumbai. Given the blouse’s interesting tassel detail, skipping ornate/chunky pieces of jewelry was the only way to go. The actor finished out her look with a clutch from Boga. Love the sari on her; she wears it well. Had the make-up been softer, more dewy, it would’ve elevated the look further. As it stands though, it wasn’t much of a deal-breaker; Sayani looked nice.